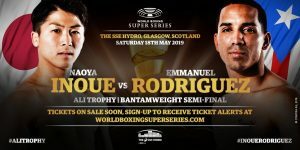 The World Boxing Super Series have announced Japanese superstar Naoya Inoue will face Puerto Rican, Emmanuel Rodriguez in Glasgow, Scotland. The bout will take place on May 18 at the SSE Arena on the same card as local hero Josh Taylor takes on IBF Super Lightweight champion Ivan Baranchyk. Both bouts are semi finals in their respective weight classes. Inoue (17-0, 15 KOs) opened up this season’s WBSS in spectacular fashion, knocking out Juan Carlos Payano in 70 seconds of the first round in their quarter final tie in Japan. There was an expectation that Inoue would have another home tie, with WBSS having secured a Japanese TV deal to show his fights so the announcement that he will travel to Scotland has come some what as a surprise. The news has already gone down well with Scottish fans and fans across the rest of the UK, with social media buzzing at the news. Rodriguez (19-0, 12 KOs) retained his IBF title in a tough quarter final bout against Australian, Jason Moloney, winning by split decision back in October in Orlando, Florida.